be prepared for extreme cold in Turkey, Iran and Pakistan. Our packing list and information on how we used during two years of traveling. The current information is written in Aqaba (Jordan) and updated in the Netherlands, after traveling through Turkey (total 2 months), Iran (2 months), Pakistan (9 months altogether), India (almost 4 months), Nepal (14 weeks), Syria (6 weeks in total), Jordan (4 weeks) and Europe (almost 2 months). 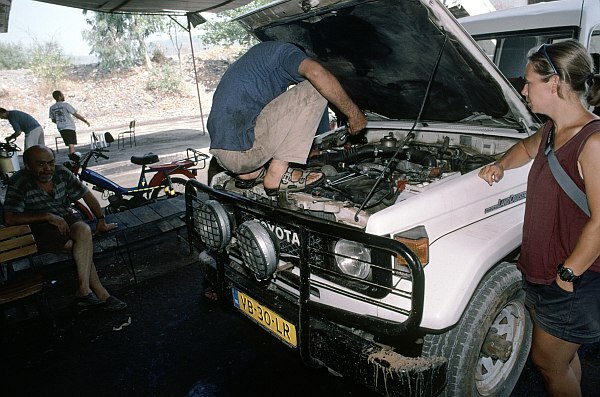 Look at our Loading the LandCruiser page to see how all the stuff and more fit into one car. Besides a description of items we also included some adresses of Toyota dealers and give with many items the availability in each country. We also give some information about Landrovers and other 4WD's; our travel friends in Pakistan had a Landrover 110. Click on each item to jump to the full text. Indispensible, of course. Although it took us actually 1.5 year before we needed a spare wheel! Ensure that the tyre size of the spares is compatible with the original rims, and vice versa, in case you damage a rim in an accident or so. We drove with four semi mud and snow tyres that came with the second hand vehicle (size 225x75R16, BFGoodrich Long Trail). The spares are two 205x70R16 tyres, which are actually better not combined with the 225x75R16 on the rear axle. (The thickness of a 225x75R16 tyre equals 225 mm x 75%, while the thickness of a 205x70R16 tyre is only 205 mm x 70%.) All of them are tubeless. Imported tyres are available in all countries but in India they can be hard to find. However, also in Pakistan and Nepal the choice is limited and even in Pakistan the prices of imported tyres exceed those back home. 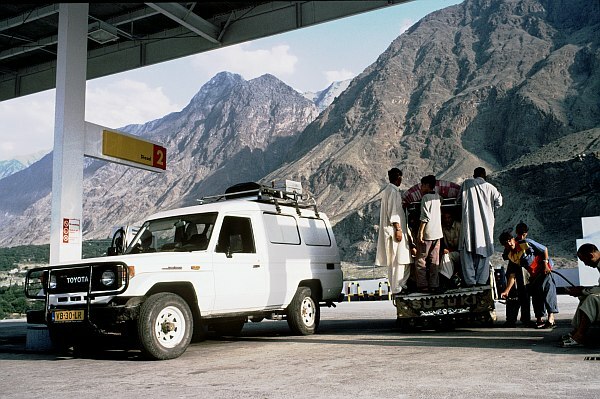 In December 2003, after traveling for 18 months and 40.000 km, we decided to buy new tyres, in Pakistan. Penny wise we decided to buy smuggled tires, even though the choice is limited. We bought 5 new Yokohama Geolandar GO39 tires, which were cheap (about US$70 each). But because of the limited choice we had to settle for the wide 255x70R16 size. We have only one spare wheel now, which should be no problem. Contrary to the information in many (British) expedition books,small punctures in tubeless tyres are easy to repair, by yourself or by a local tyre repairshop. Almost every small village has a tyre-repair-wallah with a compressor. However, when you damage a rim severely, you may not be able to seal the bead of the tubeless tyre again. On the other hand, tyres with tubes seem to be more sensitive to punctures. 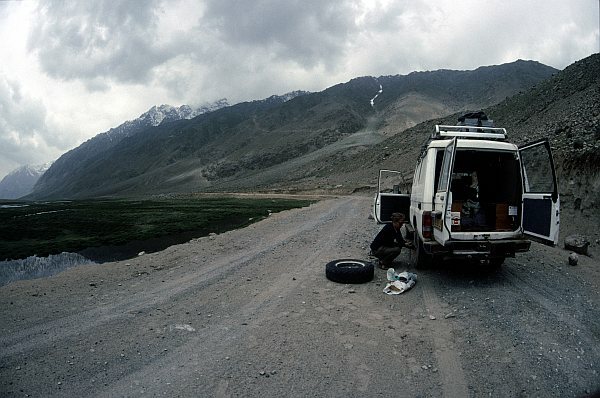 Repairing a flat tyre on the road to the Shandur Pass, Pakistan. Can be bought anywhere along the route, except of course in the middle of the desert. If one of the leaf springs breaks there, you will have to hitch a ride to the nearest town and back to buy the new ones, as towing is out of the question. A broken shock absorber is not a serious problem, but our spares came with the car and can be handy. Back in Pakistan we decided to get rid of the spare springs and shocks. In Pakistan we also fitted new genuine shocks as part of normal maintanance. Much used and very handy although almost all petrol stations (which are very frequent along our route) have air pump facilities. Our so-called "high quality" Hella pump did not last very long and now we use a cheap Chinese one. Indispensible for emergencies, but not much used yet as petrol stations are frequent, even in the Baluchistan desert or in the mountains of Pakistan. The most difficult country for getting fuel is, suprisingly, Iran. In this oil-rich country it is a good idea to have a jerrycan with fuel by hand to prevent an embarrassing situation. We chose not to built in an auxiliary fuel tank next to our 90 l standard tank. So far we do not regret that we didn't invest the huge amount of money for it. Even at the most rough mountain conditions our car drives slightly more than 6 kilometers per liter diesel. Being able to drive at least 500 km on a single tank is adequate, except for may be the Sahara. Furthermore, installing an auxiliary fuel tank often means you have to replace the springs also, because of the added weight. However, the investment in an auxiliary fuel tank could be partly earned back by taking into account that fuel in Iran and the Middle-East is much cheaper than in for example Turkey. Getting fuel is hardly a problem in Asia. This is a Shell petrol station in Gilgit, Pakistan. Bring a set of the good quality stuff. Depending on your car brand and the country you happen to be in, many filters are available (oil, fuel and air alike). However, while very cheap they are of questionable brand and quality. For the LandCruiser, Turkey was a bad place to find genuine filters (outside of the big cities), in Iran we could not find any fitting filters good or bad. In Pakistan everything is available including the genuine filters, as is in Nepal but the prices in Nepal are much higher. In India genuine filters for our 3B engine were available. Multigrade motor oil of reasonable to good quality (CE/CF grade) as well as synthetic oil is not available in Iran outside the major cities. The best we could find was CD grade. CF grade and synthetic oil is easily available in Turkey, Pakistan, India and Nepal. The same applies to other fluids: good quality brake fluid (DOT 3), ATF, power steering fluid etcetera is difficult to find in Iran, so better bring your own. In the other countries it is no problem. Note that due to the high sulfur levels (up to 2%!) in the diesel, from Turkey on you have to change oil at least every 5000 km or even every 2500 km. Motor oil brought from Western-Europe is often not designed to deal with high sulfur levels, so better buy high quality oil designed for the local market. As a default engine coolant people use only water in Iran, Pakistan, etc. It's cheap and widely available, but besides problems like rust in your radiator, it tends to evaporate in this climate so check the level more often. Antifreeze and/or antirust additives, and pre-mixed engine coolant is available in all countries. And as whe had to learn the hard way, you will need lots of antifreeze during wintertime in Iran, Turkey and the north of Pakistan (see the story and pictures in this story). Minus 10 is not uncommon and these temperatures will even freeze the low quality diesel of these countries - mix your diesel with a maximum 5 percent petrol. Bring some for emergencies (at least the one for the fan) but if you know the size these are easily bought in every tiny town along the route, unless you have a modern self-tensioning drivebelt. These will be hard to find. The easy, clean hands option: find the guy around the corner and let him do it for a few lira/rials/rupees. The grease guns can be bought but the quality of the grease may vary. Indispensible! One that can tow four times the weight of your vehicle (nine tonnes in our case) and don't forget the shackles (harpen in Dutch). One spare tow rope we brought can hold four tonnes, and doubles as multipurpose rope. The tree trunk protector is what the name says, so bring one as well. Our hand winch is an emergency tool, and not used yet. To us, an electric winch is of no use unless you drive in a group through the African desert or intend to compete in rally's or do equally demanding off-road driving. The small (original Toyota) jack the came with the vehicle proved to be toosmall. We bought a three tonne hydraulic jack in Turkey which is useful and works fine (provided you put some boards underneath). For more serious mechanic work a high jack would be a good investment. Why not? And compulsory in many (European) countries. Have you ever practised with one? We bought an aluminum one in Peshawar, Pakistan. Our second spare wheel was inside the car. Now it is on top which saves a lot of space. Some dirty, not much used equipement, or the bags of the occasional passenger, are on top, including the solar panel (which we bought in India). Fuel consumption! We estimate 10 to 20% extra at 100 km/h, much more at 120 km/h, less at lower speeds. Added height. Many of the more beautiful roads in Pakistan are narrow and with low overhanging rocks. Large 4WD cars such as the LandCruiser have trouble as it is, so 20 cm higher might make the difference between making it or not. Added instability because of the shifted center of gravity. - and a roofrack adds up! Many people ask us why we don't have a roof tent. The considerations are much the same as for the roof rack above: increased fuel consumption, height and weight. Another thing is the price of these tents: a good one costs at least a couple of hundred euros second hand, 1200 euros new. Too much in our opinion. Last but not least: in many places you really don't want to be outside your car. You want to be ready to drive if something happens. For example in India people can be so curious that they will just climb the ladder and look inside your tent, and friends of us also had kids throwing stones at them at night. All this sounds scary but it isn't really that bad: we normally sleep inside the car with the backdoors wide open! Nothing ever happened. A Landrover is smaller than a Land Cruiser, and therefore a roof tent makes more sense on the British 4WD. This picture is taken at Borith Lake, Pakistan. We do not miss it yet. Maybe in the Sahara it would be necessary. Driving through deep water will require special skills so we would not use a snorkel for this purpose. For sale everywhere, but you have to search for the good quality stuff (which is still cheaper than in Europe though). So bring the essentials (check if you need no. 18, our friends with a Landrover needed it and it was unavailable). Out of lack of knowledge, we did not bring any and did not really need any yet. If parts aren't available they can always be ordered (time consuming and expensive) or an Asian solution is always found, sometimes compromising quality. For LandCruisers spare parts are available in any country in the world. Also Pajero's are very common worldwide. Contrary to the populair believe, Landrovers are only common in Europe and around the Mediterranean - so bring lots of spare parts for your LaRo, especially because breakdowns are a second nature of Landrovers. After driving for almost 2 years under difficult Third World conditions, the only part of the engine that had to be replaced was the fluid coupling of the fan. A proof of the superb quality of Toyota LandCruisers! Bring one, if only to bury your human waste when camping. Useful but not great. It served us fine to look up things like the fluid coupling, the head gasket (broken due to the fluid coupling) or the glow plugs, when these were broken. Or to show mechanics the part you want fixed in case of language barriers. But it is too complicated to use for repairs as a step-by-step manual because it assumes a lot of mechanical knowledges. Furthermore, there is no overview picture of the motor and its components. Also it does not describe a lot of day-to-day maintenance in detail, e.g. how to change the oils or fluids. The Haynes Manuals are better but not available for our BJ75 (3B) engine. Who needs air-con when you can open your windows and have fresh air in your face? Even if it is almost 50C inside the car as it was driving through the Iranian desert. We don't have one because of costs, space and weight. Although they can be very handy on long camping trips you don't really need one if you have some other means of purifying water such as a water purifier. Expensive and space/fuel consuming, but it would have been a nice luxury. No more than that, though, so we don't have one. 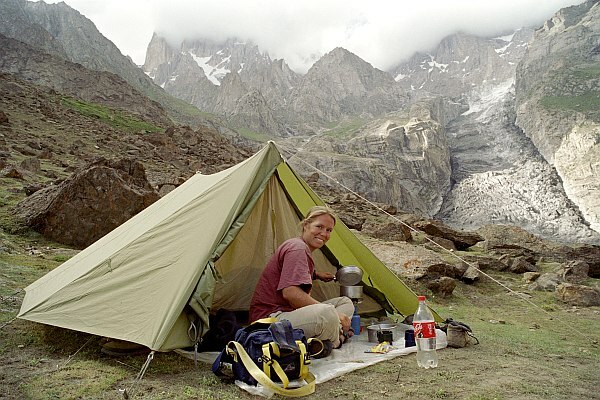 A small tent which we used for trekking in Pakistan. We brought a lightweight CampingGaz stove. A tip: use it only as emergency/lightweight trekking gear since gas cartridges are only available in Gilgit and Karimabad as leftovers from expeditions. You would expect them available in Kathmandu, but we did not find them. Now we have a big 2 liter locally made gasstove, which works very well and is very cheap if you have space in your car. Iran and Pakistan use the same system, but for India you have to buy a new one. We miss a little table as a luxury item! One that rolls up to air-mattress- size would be great. We are happy with our two chairs. Heat reflecting window screens are very useful to keep the burning sunlight as well as the curious staring local eyes outside. Ultar Meadow alone is worth the effort of bringing a small tent. A portable waterfilter is very useful! You can't keep buying those bottles of mineral water or boil all you need. We are happy with the Katadyn Combi which is a combined carbon/ceramic filter to take away bad taste, chemicals, as well as 99.99% of all bacteria and viruses. Only the ones smaller than 0.2 micron remain, but apparently these stick to mud and sand rather than float around in your drinking water and will thus be filtered out as well. The Combi pumps a bottle of water in a few minutes. The main time consuming work is cleaning and drying the filter. Another tip: bring some good containers for the water as they are not easy to buy (at least good watertight containers seem to be rare). Preferrably foldable but sturdy, 10 or 20 l. Test them for additives of the plastic which will give a terrible taste. The best ones have a tap at the bottom. We also brought chlorine and silver nitrate tablets for emergencies and in Nepal we bought iodine to use while trekking. We found tap water safe to drink in Turkey, the Middle East, Iran and some places in Pakistan. But it is always best to ask the locals if they drink it too. In Pakistan, many places have special taps for drinking water usually from wells, ask locals where to find them. In India and Pakistan the water served in restaurants is generally safe to drink, it comes from a special source or it is filtered tap water. Nepal is one of the rare countries in Asia were common sense about safe water is not part of the local culture, even in touristic Kathmandu or Pokhara. Never drink anything you didn't buy in a bottle or purify yourself, even if the Nepalis do drink it. Nepal is the only country where we got sick from the water and/or food, and not just one time. Don't worry about Delhi-belly, be afraid of the Kathmandu-loo! A great gadget but also proved to be quite useful. The Legend is the simplest version having 8 MB memory for maps. The quality of the maps varies per country but in general many minor roads are indicated making navigating through deserted areas much easier. Useful extra's include: A laptop computer with Garmin WorldMap CD-Rom to download all tracks from the GPS; a 12V adapter for the car; many rechargable AA size batteries. Etrex, where are we now? 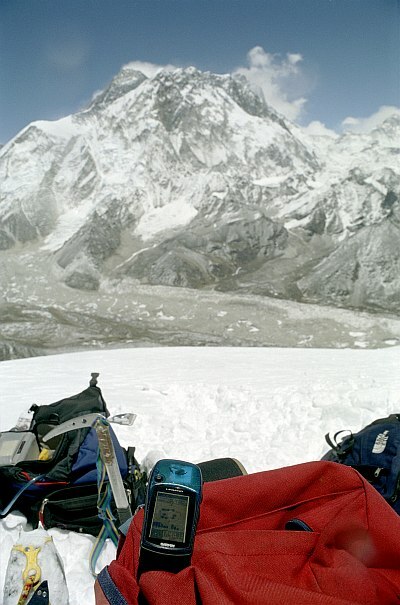 At the summit of Lobuche East, 6000 meters above sea level! Don't count too much on the GPS, the batteries may just die! Good maps and compass are very useful. We have the Recta Turbo 20 for use on Northern and Southern Hemispheres. A Casio TwinSensor with an air pressure altimeter with memory and graphs and more gadgets, a thermometer and also the usual watch accessories. Another nice-to-have toy. Good for the homesick, or for getting some news coloured by your fellow countrymen instead of coloured by local opinion. Bring a list of frequencies as well. In our opinion you need a fairly good quality receiver to get good reception everywhere in the world. And it won't work inside the car! We brought one for emergencies (sending an emergency SMS is not too expensive) but it was stolen in Turkey...Cheaper still is probably to buy one in a country if you are staying there for a longer time. The one we initially used was a heavy 7-year old machine without a CD, and a defect floppydrive. It worked fine for typing text and capturing GPS data. To write e-mails and update the website, to use the Encarta encyclopedia, the Garmin software, etc. we bought a second hand Pentium I laptop in Peshawar. If you have a modern laptop with DVD player, you can buy and watch movies in Pakistan. Just a few days before our departure decided to buy a video camera, to capture movement and sounds along the way. We were happy with our Sony apparatus, until it was stolen from our hotel room in Bodrum. After one-and-a-half year traveling we asked friends to bring a digital camera. We have carefully studied the market and it appeared that the Olympus Camedia C5050Z is the only camera that came close to our specifications. The big problems with many digital cameras are their dependence on electricity for charging the internal battery, their weak construction and most of them seemed to be designed for and by wizzkids instead of photographers. The Olympus C5050Z has the unique combination of a professional quality magnesium alloy body, a bright (F1.8) zoomlens, a clever ergonomic design and it uses AA size batteries, which gives you the possibility to use non-rechargable alkaline batteries in case of emergency or extreme cold. Therefore we bought a small solar panel in Bangalore (India) and asked our parents to bring a 12V to 220V inverter from Holland. Solar equipment is very cheap in India. We are very happy with our purchase. The combination of the solar panel and the inverter is not only useful when camping but also makes you independend from the endless powercuts and the sometimes ridiculous low voltage offered in this part of the world. Our favourite Olympus gear goes everywhere we go, including several lenses from a 16mm fish-eye to a 500mm mirror lens. We used all of them already. We use Kodachrome 64 or 25 slide film, which you need to bring from home and take back for development, as they are not for sale nor can they be developed here. Kodachrome is very resistant against high temperatures, ageing and when developed the colours will last almost for ever, while other slide films tend to fade after a few decades. We buy C41 print film and E6 slide film along the way, especially print film (100 or 200 ASA, Fuji or Kodak Gold) are easy to get and cheap. Traditional high quality cameras like the Olympus OM series survive extreme cold, heat, dust, crashes and rain, and are not completely dependent on batteries. We mounted an old army explosives chest inside the car, watertight and burglar safe. For locking up all the stuff that you don't want or can't carry around every day. We found it very useful, if only for our own peace of mind. Personal toiletries of reputable brands can be easily bought everywhere for the same prices as in Europe. This includes soap, shampoo, toothcare products, but not tampons. For first aid, we have a car kit with all neccessary bandages and sterile equipment. We also brought a sterile needle kit for emergencies. As for medicins, we did bring Ciprofloxacine (an antibiotic) but it is also for sale here. Furthermore we only brought Aspirin and an iodine desinfectant (Betadine cream), no other medicins like Imodium or ORS salt. We did not bring any malaria prophylaxis nor any medicine against it. We found 50% DEET solutions the only really efficacious bug repellent against aggressive mosquitos. Bring some as they only sell diluted DEET here. Our vaccinations were: DTP, Hepatitis A, Typhoid fever, Hepatitis B and Yellow fever. 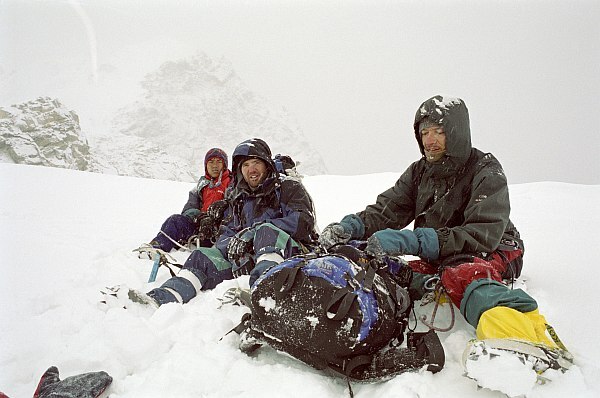 Our personal preference is to buy reasonably good but not too expensive gear. An important brand name doesn't guarantee quality and it will damage during a trip like this. As for clothing: local stuff is cheap, good as a souvenir and often very comfortable (such as the shalwar qamiz in Pakistan). Also note that shorts (and short sleeves for women) are not acceptable from East-Turkey up to the rural areas of India, although local people are generally too polite to make remarks about it. Photo's of you and your family back home (also just for showing people). Take care of which pictures you choose: not too much bare skin and not too much display of Christianity. Children are very important in most countries so bring pictures of your children or your nephews and niece. Please do not give pens, candy or money to just any kid in the street! This stuff is very cheap and widely available everywhere in the world, and they already look at us as walking mindless moneybelts! Unless of course if you think it is a good thing that the only English these kids are learning is: "money, one pen, one rupee!". It is amazing to notice that even in remote mountain villages three-year old kids robotlike greet a Westerner with "hello rupee". To healthy beggars we always say that they can wash our car for a reasonable amount of money. The result: in 9 months only one beggar wanted to work for his money! LandCruisers are not very common in Turkey, but almost all parts are available in Istanbul and can be delivered in one or two days to each village in the country - see our story in Dutch about the fluid coupling. In Iran the army and police use LandCruisers and many old FJ40's are used by ordinary people. However, since petrol is amazingly cheap, only FJ's drive around! BJ's, HJ's, HZJ's, etc. are unknown. Also playing chicken with police LandCruisers is not a good idea: with your diesel engine you will definitely lose from the 4.5 liter 24V petrol engine! Also in Syria the army drives FJ's. Both in Syria and Jordan, LandCruisers are quite common vehicles. However, parts (including filters) seem to be difficult to obtain in Syria and Jordan. Although we found the Toyota dealers in Damascus and Aleppo very good, they are not very creative in shopping around for the parts they have not in stock. The Damascus repair shop did a great and fairly cheap job of cleaning and servicing our fuel pump. It's not a lot more expensive here than in Pakistan. 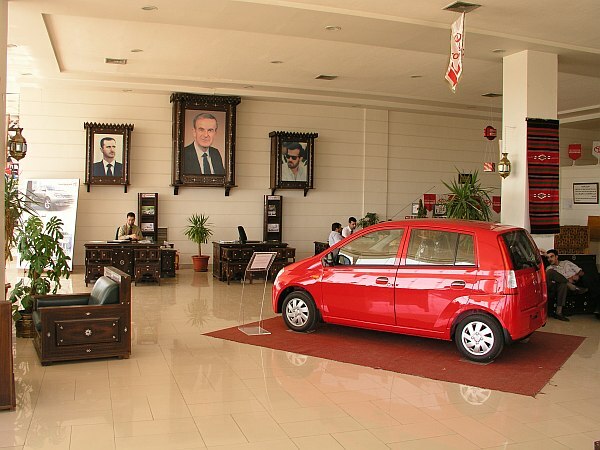 The excellent Toyota dealer in Damascus. Pakistan equals Toyota-country! 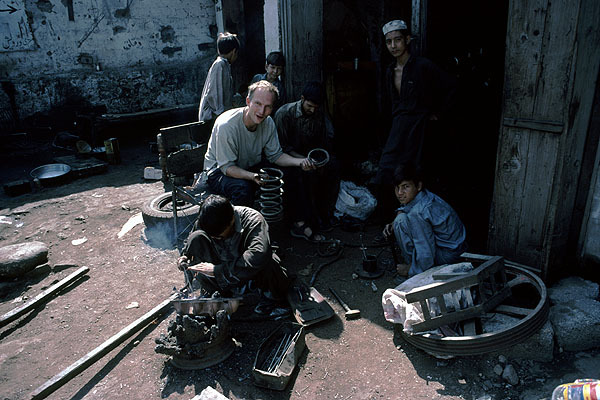 And even better: Peshawar with all its NGO's and illegal import from Afghanistan is the place to shop around for cheap LandCruiser parts (including massive 6 cylinder engines). All type of LandCruisers and Hiluxes, petrol and diesel, are common, although typical European features (i.e. a fog light) can be hard to find. Genuine parts in Pakistan cost often less than half the price of which you have to pay in Europe. Labour is of good quality (much better than in India) and very, very cheap. India has severe import restrictions and therefore only a local made Toyota spacewagon (the Qualis) is available. This Toyota has the 2L (2.4 liter) diesel engine. An oil filter and fuel filter for our 3B engine was available in Toyota Goa. The quality of work is low due to the social system: a mechanic will just do what his boss tells him to do. With our vehicle even an oil change gave a problem: they put 2 liters to much in the engine and didn't check! Maybe in Delhi or Bombay you will find a dealer who is familiar with LandCruisers. In Nepal LandCruisers are common again. Many NGO's drive around in fancy luxery wagons. However, don't think that these vehicles will ever leave Kathmandu valley. At the Toyota service in Kathmandu they had no idea how to prepare a vehicle for driving into the mountains! Parts are not very cheap since import is difficult. The quality of work is good, but in Kathmandu it took 3 days to perform an ordinary check-up which took 3 hours in Quetta (Pakistan). In general: ALWAYS check your vehicle before leaving the repairshop! Did they put in the right oil? Are the oil levels OK? Is nothing bent or dented, especially in the engine bay? In Iran not checking our vehicle resulted in a destroyed power steering because a mechanic had bent a tube while sitting in the engine bay. E71�30'27.3" Here did they fix our car after the crash. A miracle job! This is probably the best place on the whole route to get service done on your car. Toyota Zarghoon Quetta N30�10'30.3" E66�59'56.7" A major check-up within 3 hours. Excellent. Toyota Islamabad Islamabad N33�42'18.3" N73�5'3.5" Just near the camping. Go here to make your car Karakoram ready (but Toyota Frontier in Peshawar is cheaper, even though it belongs to the same company!). 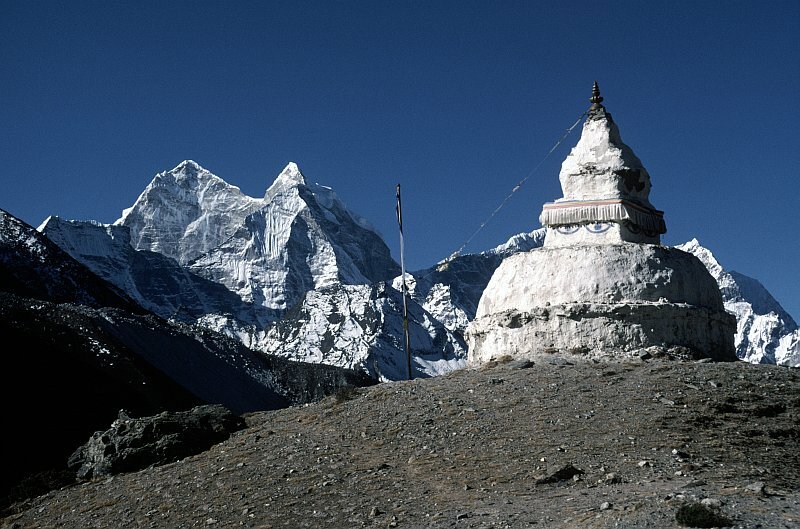 E74�19'59.7" The last stop before India! Toyota in Goa Margao N15�22'57.1"
E85�21'5.2" Near the airport. Also dealers in Pokhara and Chitwan. E36�22'33.1" Excellent job, but not many parts in stock. E37�1'45.3" Smaller than its coussin in Damascus. 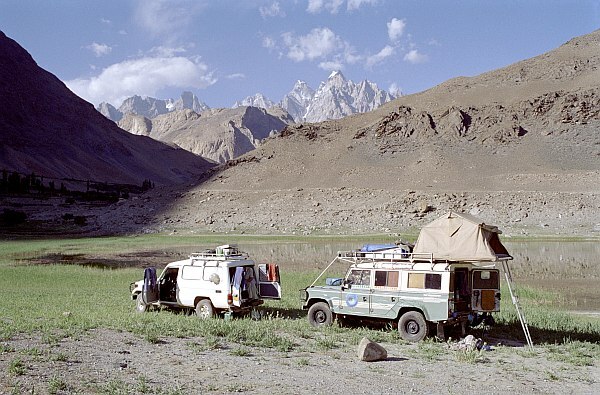 In the rough Karakorams, LandCruisers are King. The Landrover on the left is from a tourist. Landrovers are made locally in Turkey and therefore are very common. We are told that the Landrover dealer/repair shop in Istanbul is very good. In Iran local versions of the Landrover and Nissan Patrol are made. Of course these have petrol engines and we doubt if parts will fit on European Landrovers or Japanese Nissans. The police uses besides LandCruisers also Mitsubishi Pajeros. In the Middle East all types of 4WD's can be seen on and off the road. In Pakistan Pajeros are very common, Patrols slightly less and Landrovers are rare. The only Landrover dealer is in Islamabad, see below, and parts are not cheap. Take care of the coil springs with Landrovers. The mountain trails are very tough for the vehicle and we spoke several Landrover owners who had problems with the springs, but also with the suspension, engine bolts, steering shafts, etc. In the mountains Pakistanis only drive LandCruisers, Hiluxes and small Jeep Willys and not without reason! Import in India is restricted and therefore other then Indian made cars are rare. The situation may change since the import restrictions were lifted in 2003. Pajeros are made locally, but are still rare. We have heard about the existence of a Landrover dealer in Delhi. In Nepal all major 4WD's are common, including small Suzukis. Sigma Motors Islamabad N33�42'32.2" E73�3'19.0" All Landrover travellers rave about this repairshop! 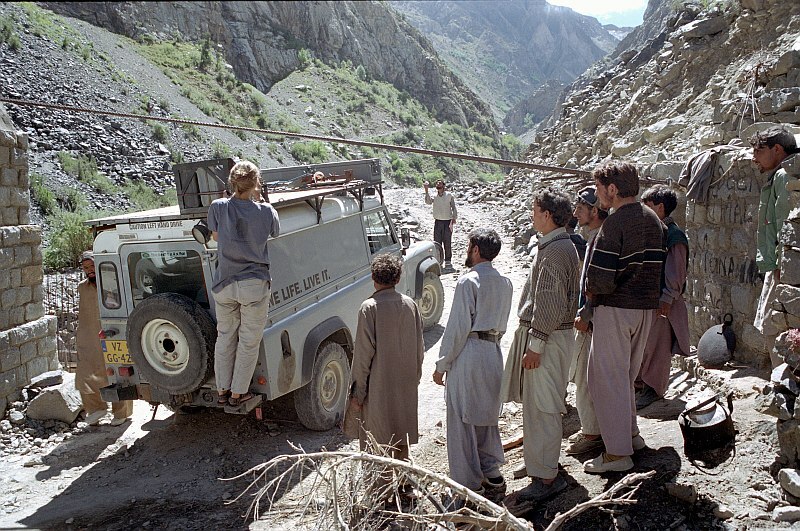 Believe it or not, Landrovers are not very well suited for the tough roads in the Karakoram. Generally, east of Turkey, Islamabad and Kathmandu are the only places where imported products are easily available, but the prices are often double of what you pay at home. In Iran and Pakistan the way of living is far more similar to Europe than one would expect from the media or the speeches of George Bush, so (the type of) products sold in supermarkets in Iran and especially Pakistan are not very different from the products sold in the supermarket back home. Of course, being able to choose from 15 different types of peanutbutter is a luxury (or must we say a curse?) limited to Europe and the USA only. In Pakistan many Western multinationals have local factories, so their products are often available very cheap. A Magnum ice-cream costs in Pakistan only Rs 25, that's 40 eurocent! Unilever is big in Pakistan! India is not so lucky, nor is Nepal, which is dependent of India for most of its products. Iran suffers a lot under the economic sanctions imposed by the USA, but Coca-Cola is available dirt cheap...In the Middle East, Lebanon is the place to buy everything, but also Syria and Jordan are quite open to Western goodies. Imported goods are, as usual, quite expensive. Jordan is more expensive than Syria. Nescafe is available everywhere. Real, freshly ground coffee is a commodity in South-India, Turkey and the Arab countries where it is dirt cheap. In Iran and Pakistan you can find coffee imported from Europe at stiff prices. In Kathmandu they sell South-Indian coffee at European prices, which is twice the South-Indian price. Locally made chocolate is available everywhere and the chocolate paste in Turkey and Pakistan is even of fairly good quality. No, you Dutch people, 'hagelslag' is not available (but then again, decent bread isn't either). In Nepal cookies and candies all come from India and like all Indian products they are more expensive here than in India. Syrians and Jordanians appear to be chocolate-lovers and local chocolate is not bad at all, although not dirt-cheap. Beer is prohibited in Iran. In the Middle East, beer, wine and spirits are widely available, even though this is also Muslim territory. It's not too expensive at one euro in Turkey, 0.80 euro in Syria to 1.20 euro in Jordan for a half liter bottle or can. In Pakistan beer is easily available in Quetta, but in other cities you have to obtain a permit first before you can buy alcohol. In the luxury hotels beer can be bought without a permit. Expect to pay at least 2 euros for a 660 ml bottle (market price Quetta). In India beer is in most, but not all, states easily available from so called "English Wine Shops" sometimes only recognizable from the red-green signs. Taxes on alcohol differ a lot from state to state: a 660 ml bottle of KingFisher costs in Pondicherry 0.68 euro, in Maharashtra 1.70 euro! The retail price of a 660 ml bottle beer in Nepal is about 1 euro. European herbs like basil, thyme and oregano are only available in luxury shops that sell imported items. Bring lots of them from home or stock up in Turkey if you want to eat decent pasta! Local made macaroni or spaghetti are available everywhere. Some other peculiarities: Feta cheese ceases to exist east of Iran, and is expensive in Jordan. Iranian feta is the best and cheapest. Mayonaise is strangely cheap and very good in Iran as well, while the Pakistani brew is too sweet and not cheap either. Stock up in Iran. For some reason, soy sauce (indispensable for peanut sauce) is not made locally in the Middle East and Iran. From Pakistan eastwards, it's good and cheap. Fresh milk and yoghurt is available in all countries, but not always in small towns. Look for the small plastic packages. Cooking cream is sold in 200 ml square packages in both Pakistan and India, but not found in the Middle East. This is invariably of the flat, unraised type, in different shapes and sizes. The quality tends to worsen as you go east with the tasty Indian naan as exception. All are best eaten within an hour of baking and cost nothing. In Turkey, the Middle East and Iran, there is some decent French bread available. Brown bread is almost unheard of anywhere. After Iran, you can go to the Patisserie in Islamabad (Kohsar Market, F6) or wait until Kathmandu for good bread. People in India and Nepal don't use toiletpaper. As a result toiletpaper is an expensive luxury item. In Pakistan, the Chinese type is cheap but only availble in the north. Deodorant seems to be available anywhere at a price. Sunscreen lotion is more difficult to find, buy it when you can and don't wait until the last minute. It is widely available in Kathmandu though. For women, tampons (the applicator type only) are available whereever imported goods are sold. We found Shaheen Chemist in Islamabad very good to buy any kind of medicine without recipe. They have a large stock of local (dirt cheap) and imported (normal Western price) medicines and a catalogue and can order anything from the West in max. ten days. Useful if you have run out of contraceptives! Dutch readers can also have a look at opdracht 9 and opdracht 28.